Arriva Max X93 provides a joyful coastal romp from Yorkshire's premier seaside resort via Dracula's haunt to the former heart of the world's iron industry. It runs at least hourly for most of the day with additional buses running in the summer season. It's operated by the German state in the form of Arriva. The cheapest day ticket that is valid throughout the route is the Arriva North East DaySaver at £7.80 for an adult. It's valid on all Arriva buses throughout the North East. If you need to use another operator's buses to connect with the X93 from elsewhere in the North East, then you need a North East Explorer ticket at £9.70 for an adult, which is also valid throughout route X93. It can be used on the buses of several operators (including Arriva, Stagecoach and Go North East) plus on the Tyne & Wear Metro and the Shields Ferry. Here's the route, stop-by-stop. Logos are hyperlinks so click through and see where the X93 can take you! Click here for a guide to which bus stops where in central Middlesbrough, but bear in mind that the X93 only stops at the Bus Station. Map of all Arriva routes in Middlesbrough. See more Arriva North East network maps here. For local journeys, the Arriva Teesside Day Saver, at £4.40 for an adult, is valid on the X93 between here and Ormesby Crossroads. It is valid on all Arriva buses in Middlesbrough and Stockton. The Arriva Teesside & East Cleveland Day Saver, at £5.80 for an adult, is valid on the X93 as far as Scaling Dam/Bunch of Grapes. It's valid on all Arriva buses across Stockton, Middlesbrough and East Cleveland. If you're travelling from or to Darlington, then the Arriva Tees Valley Day Saver at £7 has the same validity on the X93. If you're travelling beyond Scaling Dam, then use an Arriva North East Day Saver at £7.80 for an adult. It's valid the full length of route X93 and is also valid on all Arriva buses across the North East. If you're connecting from or to buses operated by Stagecoach and/or Go North East, then the multi-operator North East Explorer, at £9.70 for an adult, is for you. It's valid the full length of route X93, plus on all Arriva, Go North East and Stagecoach buses in the North East, the Tyne & Wear Metro and Shields Ferries giving unlimited travel from Scarborough to the Scottish border. Middlesbrough Plusbus, bought with train tickets to/from Middlesbrough, Stockton, Thornaby or Eaglescliffe, is valid on the X93 from here as far as Cargo Fleet/Ormesby Crossroads. 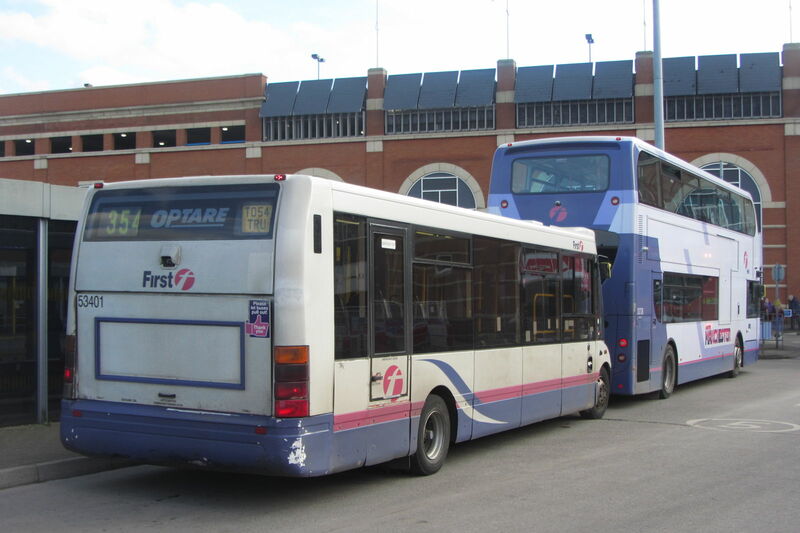 Buses to Scarborough stop on the left and buses to Middlesbrough stop on the right on A171 Cargo Fleet Lane. The crossroads after which the stop is named, with B1380 Normanby Road and High Street, is in the distance. The Arriva Teesside Day Saver at £4.40 is only valid on the X93 between here and central Middlesbrough. It is not valid any further east. To travel east of here but no further than Scaling Dam, use an Arriva Teesside & East Cleveland Day Saver at £5.80 or an Arriva Tees Valley Day Saver at £7. The Arriva North East Day Saver at £7.80 is valid the full length of the X93 route and on all Arriva buses in the North East. Middlesbrough Plusbus, bought with train tickets to/from Middlesbrough, Stockton, Thornaby or Eaglescliffe, is valid on the X93 from the town centre as far as here, but no further. See maps of all bus routes in Guisborough and East Cleveland here. Map of all Arriva routes in Guisborough. See more Arriva North East network maps here. Valid between here and central Middlebrough are the Arriva Teesside & East Cleveland Day Saver at £5.80 and the Arriva Tees Valley Day Saver at £7. They are not valid east of this stop. To continue east of here, the Arriva North East Day Saver at £7.80 is valid the full length of the X93 route and on all Arriva buses in the North East. The multi-operator North East Explorer, at £9.70 for an adult, is valid the full length of route X93, plus on all Arriva, Go North East and Stagecoach buses in the North East, the Tyne & Wear Metro and Shields Ferries giving unlimited travel from Scarborough to the Scottish border. The Arriva Whitby Day Saver at £2 for an adult is valid on the X93 from this stop, through the centre of Whitby, as far as Eskdale School. It's valid on all Arriva buses in their Whitby Town zone. To continue west of here, the Arriva North East Day Saver at £7.80 is valid the full length of the X93 route and on all Arriva buses in the North East. 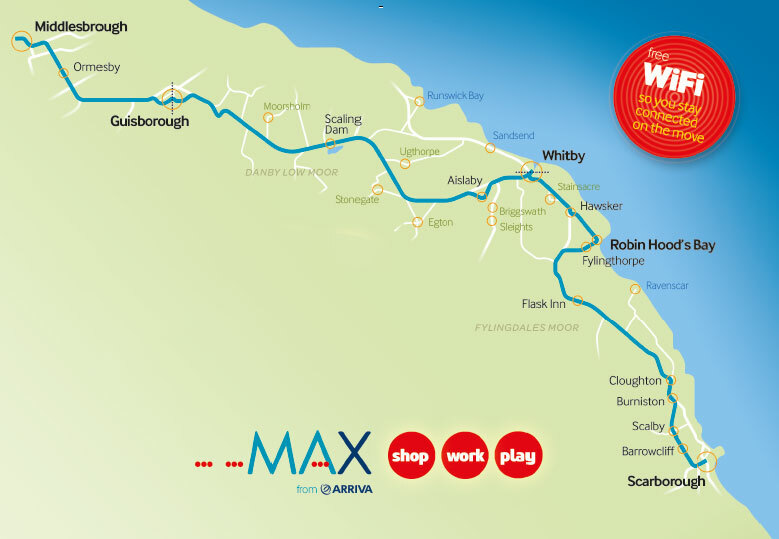 Map of all Arriva routes in Whitby. See more Arriva North East network maps here. The Arriva Whitby Day Saver at £2 for an adult is valid on the X93 from this stop, through Whitby as far as Mayfield Road/Mayfield Place. It can be used on all Arriva buses in their Whitby Town zone. It is not valid east of this stop. 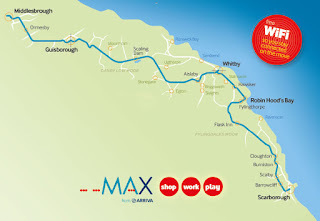 The X93's route around Robin Hood's Bay. See more Arriva North East network maps here. Scarborough Plusbus tickets, bought with rail tickets to/from Scarborough are valid on the X93 between Scarborough Station and this stop, but no further North. To travel North of this stop, use an Arriva North East Day Saver at £7.80 for an adult. It's valid the full length of route X93 and on all Arriva buses in the North East. If you need to use another operator's buses to connect with the X93 in Middlesbrough, then you need a North East Explorer ticket at £9.70 for an adult, which is also valid throughout route X93. It can be used on the buses of several operators (including Arriva, Stagecoach and Go North East) plus on the Tyne & Wear Metro and the Shields Ferry. Extra buses between here and central Scarborough are provided by EYMS route 15, which follows the same route as the X93. Please note that it does not accept Arriva tickets, nor the North East Explorer, but Scarborough Plusbus tickets are valid. Extra buses between here and central Scarborough are provided by EYMS routes 13, 14 & 15, which generally follow the same route as the X93. Please note that they do not accept Arriva tickets, nor the North East Explorer, but Scarborough Plusbus tickets are valid. The Arriva North East Day Saver at £7.80 for an adult is valid the full length of route X93 and on all Arriva buses in the North East. Scarborough Plusbus tickets, bought with rail tickets to/from Scarborough are valid on the X93 between Scarborough Station and Staintondale, The Falcon, but no further North than that.